Crate training a puppy is an exercise in patience (with Stetson it certainly was). If there’s one thing I’ve learned as a guide dog puppy raiser it’s how to crate train a puppy. More importantly I learned how to stop a puppy from barking in his crate at night! Stetson, my first guide dog puppy was very stubborn and hated his crate. Needless to say, Stetson almost ended my guide dog puppy raising career just as it was getting started. If you’ve been following my blog for a while then you already know that it took Stetson over four weeks to get used to his crate. QUICK RECOMMENDATION: There are many different types and styles of dog crates. If you haven’t decided on a crate then check out our article on which crate is best for your puppy. Dublin during one of his first puppy crate training sessions. When it comes to crate training puppies every puppy is different. Stetson was an extreme case and after those four weeks of pure torture, much to my joy he went totally silent and would sleep in the crate all morning without a peep. Dublin was on the other end of the spectrum and only had a couple nights of whimpering before he began sleeping through the night. Over the years I’ve learned many tips and tricks for crate training puppies. Today we’re going to first share with you the basics of how to crate train a puppy and second, give you our best tips and tricks for those of you who have a stubborn puppy who doesn’t want to adjust to his crate. QUICK TIP: We prefer the wire crates over the molded plastic crates for several reasons. Our wire crate is collapsible making it easier to store and travel with. The wire style crate circulates air better and gives us an option of either leaving it open or covering it with a blanket to make it more like a den. Longevity! We’re still using the same MidWest Life Stages Double Door Crate w/ Divider that we had when we brought home Linus over 13 years ago. As a guide dog puppy raiser we are given exact steps on how to crate train our puppies. A crate is a wire or molded plastic kennel that simulates a nest or den environment. A crate can become a puppy’s safe place, not to mention a house saver. When properly used, the crate becomes a security blanket, a place where the puppy can retreat to escape the household confusion and to feel secure. Never use the crate as a form of punishment! Zoom Zoom! Crate Training your Golden Retriever puppy. The dog crate should offer a positive, secure environment, a calming zone. The crate can be effective in house training. Confined to a crate, an unattended puppy cannot destroy or soil anything. 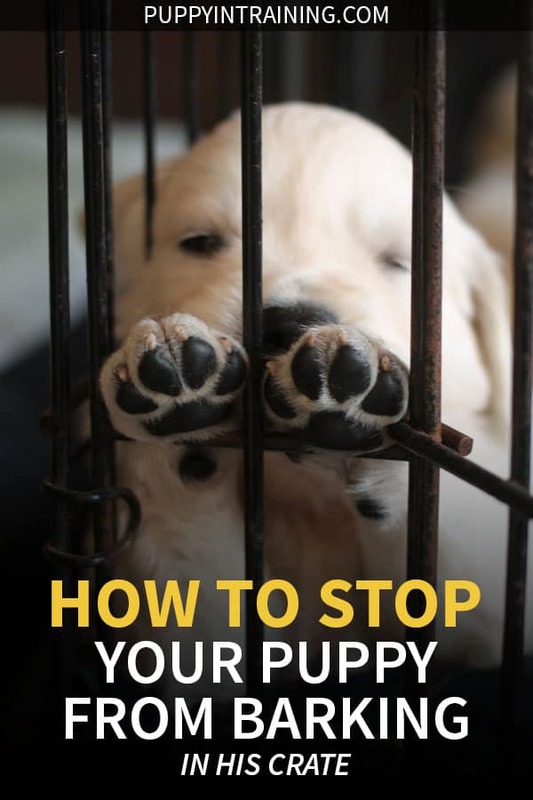 Do not crate the puppy during the day for more than 3 hours. Start crate training your puppy on his first night. Put a blanket or towel in the crate for bedding. QUICK TIP: We’ve been using the Snuggle Puppy Toy w/ Heartbeat and Heat Pack to help our puppies get used to their crate. It worked great with our most recent golden retriever puppy, Charlie. A pup will rarely soil the crate, however, if he does, try removing the bedding. A crate should not be too big, but large enough for the puppy to stand stretch and turn around. When placing the puppy in the crate, use the word “kennel” or “kennel up”. Do not hesitate to periodically use the crate, even while you are home. QUICK RECOMMENDATION: From day 1 we start feeding all meals in the crate. We feed all of our pups Wellness Core Puppy Food. 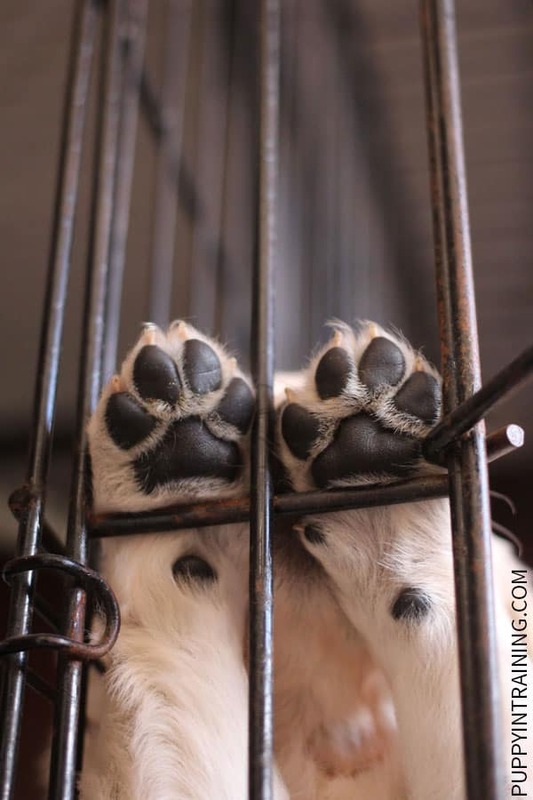 Working on crate training – Puppy Paws! Over the past 10 years we’ve learned quite a bit about crate training from crate training our first puppy, Linus who we rescued from the animal shelter, to working on crate training litters of puppies as foster parents, and finally crate training our very own service dog puppies. As you might have guessed over those 10 years we’ve learned many crate training tips and tricks. In Episode 1 of Puppy In Training TV we talked about some of the first things we do when bringing home a puppy. We also talked a little bit about how to crate train a puppy and Dublin’s first night in his crate. Lucky for us there weren’t too many nights of Dublin howling in his crate although we did catch a little bit of whining on video – see below. If you get to meet your puppy’s litter mates then bring a plush toy (our new favorite plush toy for puppies is the Snuggle Puppy Toy w/ Heartbeat and Heat Pack) or blanket to rub all over his litter mates. When it comes time to put your pup in his crate leave the toy or blanket in the crate with the scent of his litter mates this may help your pup sleep better at night. This worked well with Dublin. If your pup wakes up crying in the middle of the night take him straight to his potty spot to relieve himself. As soon as he finishes up his business take him straight back to his crate without any play time or other distractions. Make sure you feed him at least an hour and a half before bedtime. Also, it’s been suggested to cut off water an hour and a half before bedtime so he won’t have to pee in the middle of the night. We don’t cut off water to our puppy because it’s so important to keep your puppy hydrated. Play with your puppy for an extended period of time just before bedtime to tire him out. If you have a wire crate try putting a sheet over it to make him feel more cozy and enclosed. Be careful because I’ve had pups pull and chew on the bed sheet over the crate. You can try sleeping on the floor next to the crate. This worked with my rescue puppy, Linus. Feed him his meals in his crate. This will make him more comfortable entering his crate. Put different textured toys in the crate to keep him company. Be careful. I’ve had pups chew, destroy and swallow plush toys when unsupervised. If he takes a nap during the day move him from the floor into the crate. Try doing this with the door open and closed. Try leaving the door open but lying down across the doorway of the crate as if to nap with him, to make him feel more comfortable in the crate, and at the same time make your body block the doorway. When he’s in the crate and being quiet make sure to give him lots of praise. Try the heart beat toy. I’ve heard of a toy that simulates the mom’s heartbeat that helps the puppy sleep. We haven’t tried this one yet, but if we have another stubborn pup it will be on our wish list. UPDATE: We used the Snuggle Puppy Toy w/ Heartbeat and Heat Pack with Charlie and his first night in his crate…not a peep! Do you have a ticking clock lying around the house? You might try that instead of purchasing the Snuggle Puppy. It may help soothe your puppy to sleep. Try putting a stuffed KONG (we like the KONG Extreme which is better for heavy chewers like our Lab puppies) in the crate with your puppy. We’ve tried peanut butter (make sure the PB is safe for dogs), but you can try adding other treats like bananas, rice, chicken, yogurt to help get your puppy accustomed to being in the crate. You can also help your puppy get accustomed to the crate (and stop the barking) by giving him his favorite chew, one of our favorites are Bully Sticks. Just make sure you monitor your pup if you give him a chew he can consume like a Bully Stick. The one that worked for me and Stetson – I was a wreck and I thought Stetson would never get used to his crate. The only way I was able to get him to sleep was to talk to him for 5-10 minutes, telling him what a “good boy” he was when he wasn’t crying (if he did cry I would just keep silent tell he stopped). To try and quiet him down I’d either say “quiet” or “Shhh”. Try the heated toy. I’ve also heard of a toy that has a thing on the inside that you can warm on the inside and insert in the toy. Makes the puppy feel like he’s with one of his litter mates. Another one we haven’t tried yet, but will be on the top of our wish list if we have a pup who doesn’t sleep. UPDATE: Our Snuggle Puppy Toy w/ Heartbeat also came with heat pads, but we didn’t use it when crate training Charlie. One of our readers had a great suggestion: “We now have a new furbaby, another Golden. He is 8 wks and boy has he reminded us how.much older we are now. We use the same nighttime method with the soothing music and it’s worked like a charm again!” We play soothing music for our older dogs when we leave the house. It never occurred to us to use soothing music to help our pup’s get used to their crate and new environment. Thank you K.Y. for the suggestion. Those are my best tips and trick for getting your puppy to stop barking in the crate. Do you have any tips or tricks on how to stop a puppy from barking in his crate? We’d love to hear about your experiences crate training your puppy. Is this one of your first nights home with your new puppy? If so, check out Stetson’s first night home and read about what we did to ease him into his new home. ONE FINAL NOTE: We recently found and plan on ordering the Snuggle Puppy – New Puppy Starter Kit which includes the Snuggle Puppy Toy, heartbeat, additional heat pads, chew toys and blanket. Also, we recently put together our New Puppy Checklist detailing all the products we recommend for new puppy owners. UPDATE: This post was originally posted July 11th, 2011. It has been updated with new information based on our experiences over the years. THis has been great for me! Thank you so much. My puppy is 9 weeks and sleeps well in the crate since we got her a week ago thanks to this website! At present I am sleeping downstairs with her near the crate that’s rthan bringing the crate upstairs so as not to wake the whole house. She only wakes once for the toilet in the night and settles well after. But… what do I do now? How do I transition from sleeping near her to her sleeping downstairs in the crate by herself? Many thanks ! Desperately trying to get some advice on my 5 month pup. He has been crate trained since day one. The first couple of months, he would whine and bark and screech (it sounded like he was being murdered) when we put him in at night but then would eventually settle down. After that, he would go to sleep quietly, and stay quiet through the night (occasionally would wake up in the middle and bark for 15 minutes or so, but then settle back down). Then in the last month, he has become a middle-of-the-night terror. He goes in for bed quietly and settles in fine, then at about 4-4:30am he’s up and barking/screeching endlessly. This past week, it has gotten progressively earlier and earlier, until last night when it was a 2:30am wake up call and he would not settle back down. NOTE: he does not have to go to the bathroom, and I don’t think it’s separation anxiety because when the 4:30am wake ups started happening, I got up and let him out and he would curl up on the main floor and go right back to sleep (I would go back up to bed myself on the second floor) and he would be out until I woke up a few hours later. It seems to be a crate issue – he wakes up in it, and does NOT want to stay in there. He has never been destructive, so I’m not really concerned about leaving him out (if it meant both of us sleeping through the night, I would just let him sleep on his bed outside of the crate every night), but we want to be able to crate him when we have to leave the house and am worried we’ll undo ALL of the training so far if we start leaving him out at night. Any insight into what could be going on and what we could do? Our puppy is fine in the cage overnight, but as soon as we get up in the morning (or she hears our alarm go off) she starts barking. It’s hard to wait until she’s quiet because we’re moving around the house getting ready for work. We also put her in her cage during our dinner time and she barks like crazy. Any suggestions? My puppy is almost 4 months old, a very small breed. We know he can hold his pee for up to 6 hours, and will if he is in one of my kids beds or directly with us. However, if we crate him, he will undoubtedly pee in his crate within 2-4 hours ( we have followed all the protocols for crate training with proper sizing, making it a nice place, ect) and then start in with his ear peircing barking. I will often put him in one of the kids beds so he will stop barking and go back to sleep, and he does and then usually sleeps through the night without incident. Placing him in his crate in our rooms does not stop the barking. What should we do? Send them to Paris without a return address tag, like Paddington Bear in London. Just kidding, but this actually made sense to me for the last two weeks at three A.M., while waiting for him to do his business in the yard during a two-inch snow storm with winds blowing at thirty miles an hour and the dog biting my ankles, my pajamas, tripping me, and eating gravel and wood chip mulch, worrying about the $3000 vet bill for intestinal obstruction surgery. I would like some advise on my 2 year old dog that we have had for 2 months – he doesn’t like the crate at night but this is new. We have just introduced it after several different ways of the whole house getting a good night sleep. He goes in his crate, it’s cosy with blanket and soft teddy in. He just wo t settle, if we aren’t in the room with him. He howls, whines, barks and doesn’t stop. If we go to him and lay on the sofa he settles. Is this separation anxiety? And if it is, how do we overcome this is it a time thing or is there a product that will help. Having a similar issue with the 1 1/2 year old dog we just got. At first he was really good, and now he just will not settle down at all. Jumping, nipping, barking like mad in the crate and if we leave him in the yard.